How do you grow algae in your hatchery? If you answer 'Yes' to any of these questions you need to click here for help! Are you still using a batch system, with all the time-consuming repetitive work which this involves, or struggling to maintain sterile conditions economically using filters? 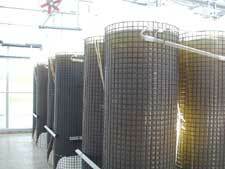 Is output limited by algae production, which you cannot expand for reasons of manpower, space and cost? Do you have several people working nearly full-time on the phytoplankton, upon which your production depends, whose holidays or sick-leave bring you close to crisis? Are half your algal cultures unready to be harvested at any one time? Do you spend a small fortune on heating then pour large quantities of warmed water down the drain? Do your cultures vary widely in quality, from the time when you can start cropping them until the moment they have to be dumped? And do they sometimes fail just when you need them most? Seasalter Shellfish continuous algae systems used all over the world, mainly by shellfish hatcheries, have seen some new applications recently with the introduction of rotifer culture. (Species illustrated Brachionus plicatillis). Rotifers are cultivated in an open flow system. In fact the flow is just neat algae culture. As the algae system uses only pasteurized water the rotifer cultures are free of any harmful contamination such as vibrios, viruses or ciliates. A typical rotifer culture will reach a density of 1500 to 2000 rotifers per ml. Everyday 50% of the volume of the culture can be harvested. The following day as the culture has reach its overflow level, the density is back to its normal level and the process can be repeated indefinitely. With the shortage of Artemia availability worldwide, high quality algae and rotifer production seems to be the obvious answer. These essential fatty acids (EFA) cannot be synthesized de novo by the fish but are naturally present in the algae species grown in the bags system like Chaetoceros, Isochrisis, Pavlova or Tetraselmis. But what is crucial for good development and the survival of the fry is not just the presence of these PUFA but their ratio between one and other. By its flexibility the bag system allow you to grow as many different species as you have bags in your system if you whish to do so. It then very easy once you now the EFA composition of the different algae species to arrange a balanced diet close to the required ratio of PUFA you are looking for. This very simple yet very clever way of growing rotifers will help you to get away from yeast and other food enrichment additives that usually leads to poor quality live food. Soon a new Cod farm situated in Norway will also be able to benefit from the quality rotifers produced with the help of a Seacaps continuous algae system. Each system supplied comes with full staff training and full back up.